Super Blood Moon Lunar Eclipse Brings Radical Shifts! 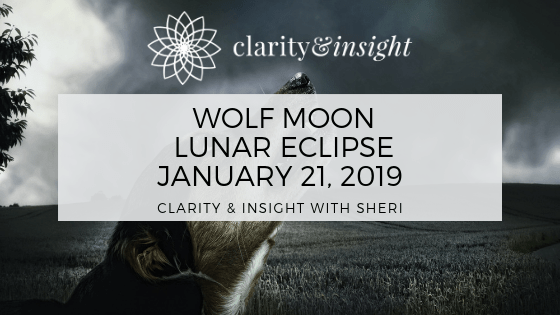 SUPER BLOOD WOLF FULL MOON LUNAR ECLIPSE Monday, January 21, 2019, in the first degree of Leo, is a total lunar eclipse! We can all feel a little cray cray around a full moon, and this lunar eclipse will not disappoint! This wolf moon with total lunar eclipse will leave you in howling as surprises, emotional upheavals and a desire to break away from your ordinary life leave you with a new respect for the moon. The moonbeams of this Lunar eclipse will be casting shadows on your hidden desires. That’s not always a bad thing as it allows you to get in touch with what you want versus what you need. If you are settling in your life this eclipse will shine a bright light on those areas, but stay in awareness of what you really want, or you could find yourself cleaning up messes made during this full moon for the next six months.YIKES! Soul lessons are usually learned the hard way! The influence that has the most potent effect is the Moon square Uranus, the planet of unpredictability. January 21st Lunar Eclipse has only a few critical astrological aspects that but the few it does have will have a some Astro whoop a** behind it. With Uranus Square the Moon, your life will feel like you have been on an emotional roller coaster and you are getting off in the funhouse, not sure which way is up! Since the moon rules emotions, you can expect this super moon with eclipse to be off the chain, with your emotions running high and unexpected abrupt changes are around every corner leave you feeling unsettled. Be forewarned, you could be in for another karmic lesson! As luck would have it, Uranus is also square Mercury, the communication planet. Sudden revelations could radically change your plan, and the headlines won’t disappoint! You may feel like you are always behind the eight ball, playing catch up or trying to clear up paperwork or misunderstandings. Think twice before making lasting changes or agreements during this lunar eclipse or you could live to regret it. Allow yourself a different perspective to help you break through self-imposed barriers. All the lunacy around this eclipse is likely to cause anxiety and uncertainty about the future. What can you do to maintain your sanity within all the turmoil? Clear emotional baggage from 6 months back. This eclipse can radically “clip” away the emotional baggage you have accumulated over the past, with an emphasis of revelations over the last six months. You can do this through energy healing, conscious release, prayer, and chakra balance to name a few. Do not make sudden changes. I know that opportunity sounds golden, but take a moment and think. Is this really the chance you have been waiting for or another lesson waiting to be learned? Avoid overreacting. Things may be going sideways, and you could feel like the sky is falling. It’s not, so take a chill pill and cut some slack for family and friends. Whatever excitement this moon brings into your life, you can stay calm cool and collected! Need one on one advice? Schedule your reading today!